22 August 2014. Nairobi, Kenya. 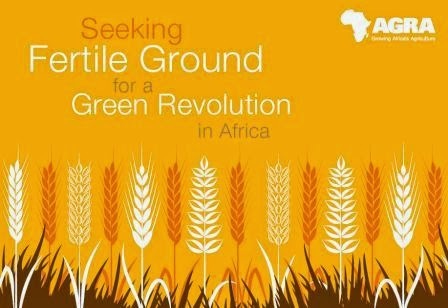 Launch of a new report from the Soil Health Program of the Alliance for a Green Revolution in Africa (AGRA): “Seeking Fertile Ground for a Green Revolution in Africa.” (August 2014, 18 pages). The report highlights the decline in soil fertility in sub-Saharan Africa over the years and the work by AGRA’s Soil Health Program and its partners to restore degraded farmlands and increase yields for Africa’s smallholder farmers. The study is the result of a five-year program called “Integrated Soil Fertility Management" or ISFM, initiated by AGRA and a consortium of international partners. The program is designed to support some 3 million smallholder farmers in sub-Saharan Africa, where badly eroded and nutrient-deficient soils - coupled with unsustainable farming practices - has led to severely depressed yields for crucial staples like maize, banana, and cassava. Unsustainable farming practices, like failure to rotate crops or apply mineral or organic fertilisers along with persistent soil erosion are depriving croplands across sub-Saharan Africa of 30 to 80 kilos per hectare of essential plant nutrients like phosphorous and nitrogen. The analysis of AGRA focuses on intensive efforts initiated five years ago to move aggressively to support smallholder farmers in sub-Saharan Africa, where lack of agriculture extension services and a scarcity of basic soil supplements have contributed to severely depressed yields for crucial staples like maize, banana and cassava. "We've shown that it's possible to work on a very large scale to help smallholder farmers adopt sustainable and profitable approaches to crop production, with the proof there for all to see in the form of significantly larger yields," said Dr. Bashir Jama, director of AGRA's Soil Health Program. Bashir Jama, Director of Soil Health Program, AGRA , at the side event, "Fostering Sustainability and Resilience for Food Security in sub-Saharan Africa: An Integrated Approach." IFPRI 2020 conference on Building Resilience for Food and Nutrition Security, May 15-17, 2014, Addis Ababa, Ethiopia. The African Fertiliser and Agribusiness Partnership (AFAP) through a Soil Health Programme has set aside USD25m to increase fertiliser supply, reduce the price by at least 15 percent, and double total use in Tanzania, Ghana and Mozambique. AFAP is collaborating with the New Partnership for Africa’s Development (NEPAD), the Alliance for Green Revolution in Africa (AGRA), the International Fertiliser Development Center (IFDC), the African Development Bank (AfDB), and the Agricultural Market Development Trust - Africa (AGMARK). AFAP’s intervention promises to have nine new or improved blending and/or granulation plant facilities, 600 new or improved retail or cooperative storage facilities, and to deliver 225,000 tonnes to farmers in the three focal countries, the goal is in addition to the 187,000 tonnes that the Soil Health Programme is targeting. AFAP is also working to develop “hub agro dealers” who have large storage capacity and a business that can support smaller dealers in their area as a move to enhance the process, AFAP provides both matching grants and technical support.